The new design is described in the journal Science by MIT’s Nicholas Fang; former postdoc Howon Lee, now an assistant professor at Rutgers University; visiting research fellow Qi “Kevin” Ge; LLNL’s Christopher Spadaccini and Xiaoyu “Rayne” Zheng; and eight others. 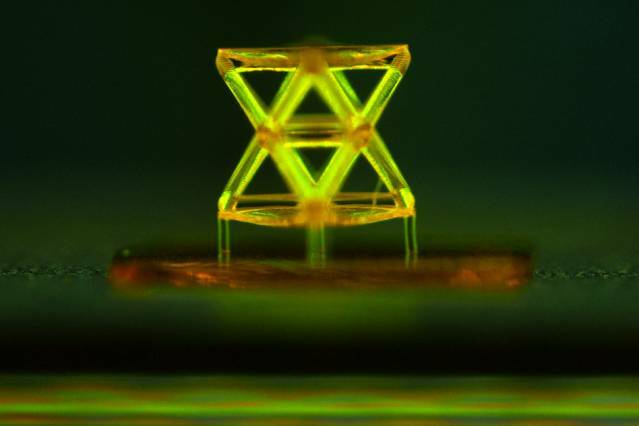 The design is based on the use of microlattices with nanoscale features, combining great stiffness and strength with ultralow density, the authors say. The actual production of such materials is made possible by a high-precision 3-D printing process called projection microstereolithography, as a result of the joint research collaboration between the Fang and Spadaccini groups since 2008. Normally, Fang explains, stiffness and strength declines with the density of any material; that’s why when bone density decreases, fractures become more likely. But using the right mathematically determined structures to distribute and direct the loads — the way the arrangement of vertical, horizontal, and diagonal beams do in a structure like the Eiffel Tower — the lighter structure can maintain its strength. The geometric basis for such microstructures was determined more than a decade ago, Fang says, but it took years to transfer that mathematical understanding “to something we can print, using a digital projection — to convert this solid model on paper to something we can hold in our hand.” The result was “a pleasant surprise to us,” he adds, performing even better than anticipated. “We found that for a material as light and sparse as aerogel [a kind of glass foam], we see a mechanical stiffness that’s comparable to that of solid rubber, and 400 times stronger than a counterpart of similar density. Such samples can easily withstand a load of more than 160,000 times their own weight,” says Fang, the Brit and Alex d’Arbeloff Career Development Associate Professor in Engineering Design. So far, the researchers at MIT and LLNL have tested the process using three engineering materials — metal, ceramic, and polymer — and all showed the same properties of being stiff at light weight. Using light to imprint features onto polymer or plastic, Associate Professor Nick Fang’s research led his team to disprove the established diffraction limit, proving for the first time that it is possible to print sub-wavelength features one-hundredth the thickness of a human hair. His discovery allows manufacturers to imprint finer features into items such as DVDs to significantly improve storage capabilities, or to probe the traffic of protein or DNA. This approach could be useful anywhere there’s a need for a combination of high stiffness (for load bearing), high strength, and light weight — such as in structures to be deployed in space, where every bit of weight adds significantly to the cost of launch. But Fang says there may also be applications at smaller scale, such as in batteries for portable devices, where reduced weight is also highly desirable. Another property of these materials is that they conduct sound and elastic waves very uniformly, meaning they could lead to new acoustic metamaterials, Fang says, that could help control how waves bend over a curved surface. Others have suggested similar structural principles over the years, such as a proposal last year by researchers at MIT’s Center for Bits and Atoms (CBA) for materials that could be cut out as flat panels and assembled into tiny unit cells to make larger structures. But that concept would require assembly by robotic systems that have yet to be developed, says Fang, who has discussed this work with CBA researchers. This technique, he says, uses 3-D printing technology that can be implemented now.